Charge of the Light Brigade is Impressions' recreation of one of the most idiotic military "battles" ever fought: the Crimean War of 1854 - 56 between Turkey and Russia, which led to a famous poem of the game's name by Lord Alfred Tennyson. 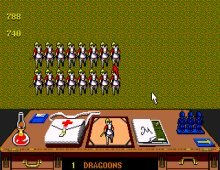 In common with Impressions' other "Micro Miniatures" games, Charge of the Light Brigade suffers from mediocre graphics and poor user interface. The depiction of the charge itself is accurate in many respects: it has five regiments attacking in line, along a very wide valley. However, poor AI and confusing interface soon make any strategy you plan completely unnecessary. The bottom line: read Alfred Lord Tennyson's poem instead, or watch the movie of the same name that sent Erroll Flynn to stardom.